For every online business to be successful, you need to use the best social media marketing tips and LinkedIn is one of the most popular social media platforms. With the LinkedIn marketing strategy, you are not only assured reaching the right audience, generating profit is also a guarantee. Using LinkedIn for business is one strategy that has helped many businesses in the previous years. The LinkedIn marketing guide I'll be sharing here helped me in 2016, 2017, 2018 and I'm sure it'll be also be of great help in 2019 and 2020. Yes, you might be asking for how sure I am, well with the right tips on how to use LinkedIn for business, you won't have to be concerned about getting leads for your business. B2B (e-biz) stands for (business-to-business) and it's the exchange of products, information or services online between businesses instead of between businesses and consumers. It is simply when a business firm makes a business or commercial transaction with another and typically occurs when a business is sourcing for materials for their production process. So in a normal sense, every business needs the services of another to operate. LinkedIn b2b marketing is a LinkedIn strategy that every business can start applying today in order to reach more customers. In 2016, LinkedIn reached more than 400 million users all over the world and unlike Facebook, majority of LinkedIn users are professionals so getting leads won't be a hard task. When LinkedIn is included to your marketing strategy, you won't have difficulties in targeting connections, generating higher and quality leads, improving the visibility your brand and most importantly, reinforcing relationships with prospects. Increase your organic visibility: LinkedIn company pages are indexed by search engines so optimising yours will in no little way, help you to get noticed more. Updating your page can help boost your unique visitor traffic and organic search visibility. It'll also drive traffic to your website when you link back to it. 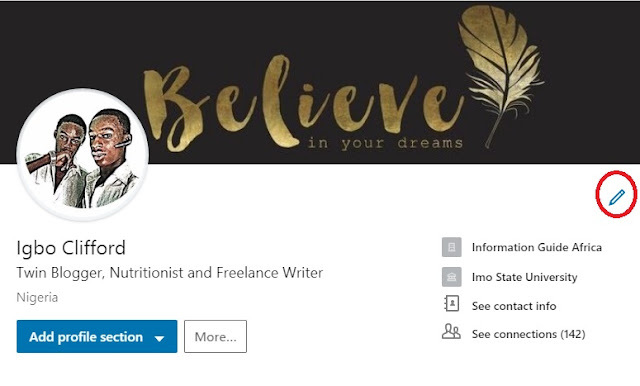 Boost your LinkedIn presence with targeted contents: Unlike many other social network platforms that you can use for your business, LinkedIn users mostly connect with people of like passions. I don't know if you understand but I'll explain it a little more. On Facebook for example, you'll see that most of your friends might be there to post jokes, personal photos and other irrelevant stuff but on LinkedIn the reverse is the case. LinkedIn will make it easier for you to connect with people of like passions or people that work within your industry. Build relevant connections: When you create a LinkedIn account, the next step should be to update your profile. Look at the red circle above, it should be on your LinkedIn profile and you'll use it for editing your profile. After that LinkedIn will start connecting you to people of the same network. Create engaging adverts: Annually, more than 5 trillion adverts are displayed to consumers and majority of them don't actually convert. If you'd want your ads to convert better, you should try showcasing the value of the product through storytelling. It can be a video ad or text, but the introduction should be attractive and engaging. Participating in LinkedIn groups that are related to your niche will help you market your products without directly advertising them. Build engagement and visibility and with LinkedIn groups: LinkedIn groups will help you improve your company's authority and visibility on LinkedIn. Use LinkedIn InMail: LinkedIn InMail is a very essential part of LinkedIn marketing. With the InMail activated, you can directly contact anyone on LinkedIn. However, it's a paid feature so I might say that it's like the Facebook ads. According to neilpatel.com, InMail response rate is 3x that of traditional email and your mails won't be caught in email spam folders. Spy on your competitors: You heard me right, spying on your competitors will hep you to know their strategies and achievements. More than 90% of business-to-business marketers are using LinkedIn for sharing their contents so it's a connect with them and identify the trends and marketing opportunities that will help your brand grow. 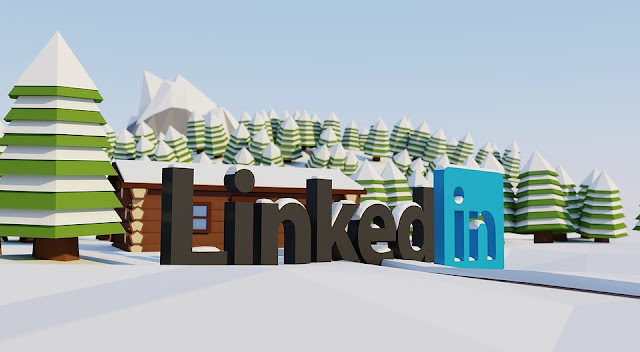 Follow LinkedIn blog: The LinkedIn blog is a custom and organised selection of articles that are specifically designed to help improve your LinkedIn marketing. LinkedIn is an amazing social network that you can start using today as a business owner. As we are advancing in technology, many Africa countries like Ghana, Nigeria, Egypt, Gambia, Zambia, Zimbabwe and many others are seriously joining the LinkedIn platform. It is an amazing platform for connecting professional in any field. You can also consider using LinkedIn ads to help you reach more targeted audience.